Check for differences in the specifications or features of the instruments. Check whether the value is within the specifications (error) of each power meter. Check whether the measuring range is set appropriately. Check whether your power meters have harmonic measurement functions. If the measuring range is too large relative to the input signal, the amount of error will increase. Differences in measured values can occur due to DC offset and other effects on AC power meters and AC/DC power meters. If the waveform is subtly distorted, harmonic components are present. The effects of such harmonic components can cause differences in measured values between power meters dedicated for 50/60 Hz and power meters supporting harmonics. Check whether the value is within the specifications (error) of the high frequency input of each power meter. The frequency characteristic (bandwidth) of power meter A is higher (frequencies are attenuated on power meter B). Power meter B has superior common mode (voltage) rejection ratio characteristics. With 0.02% accuracy and 1MHz bandwidth, the WT3000 delivers where the highest precision measurements are required. It is the industry standard for R&D work on inverters, motor drives, lighting systems and electronic ballasts, UPS systems, aircraft power, transformer testing, and other power conversion devices. The PZ4000 is designed for High Frequency Power Measurements as well as Transient Power Measurements. Its real-time acquisition system can perform cycle-by-cycle power measurements. One to Four input elements offer Basic Power Accuracy of 0.2% with 2 MHz Bandwidth and 5MS/sec digitizing rates. The High-end WT1600 is designed for a wide range of applications, from energy-saving to large load applications. The WT1600 has a six element input capability to provide maximum flexibility, and Basic Power Accuracy of 0.1% with 1 MHz Bandwidth. 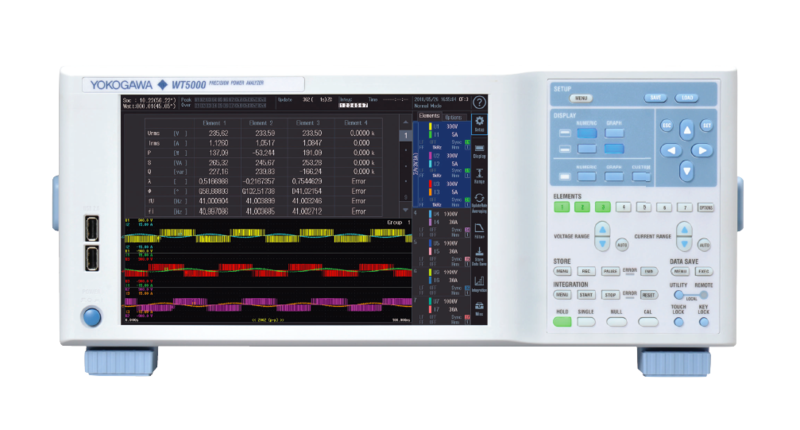 The WT1800 Power Analyzer offers maximum flexibility with up to six wattmeter elements, high bandwidths, simultaneous high speed digitizing, and wide voltage and current ranges. Although this model is still available, the newer WT1800E offers higher accuracy. The WT2000 digital powermeter series has been designed with emphasis on basic performance (bandwidth, accuracy, response speed, and noise immunity) from the viewpoint of measurement of electrical quantities. The broad range of functions of these power analyzers enable them to be used in various fields of applications. 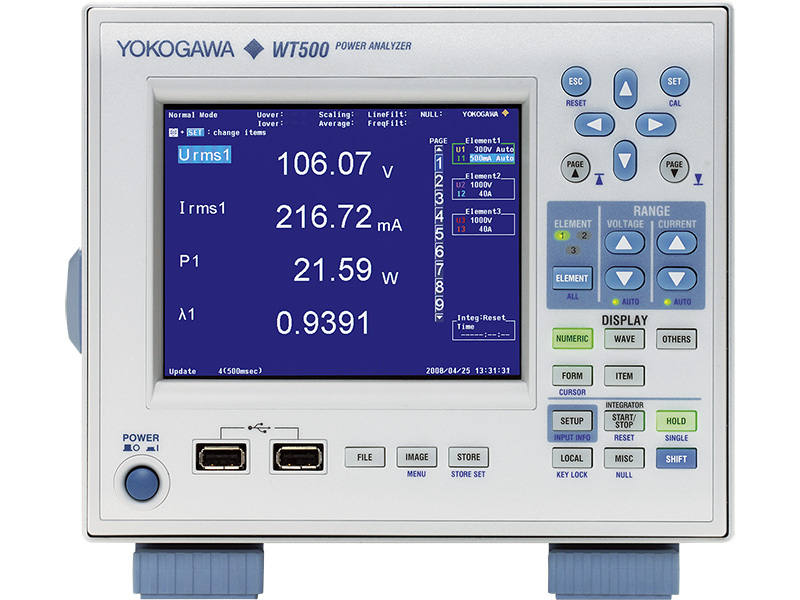 Yokogawa, the world's largest manufacturer of energy and power analyzers and meters, provides a broad choice of digital power analyzers to satisfy all requirements.